Weight loss can help you look and feel better, and might even lower the risk of certain diseases, such as heart disease and diabetes. A diet doesn't need to be overly restrictive, though, and making specific foods off-limits can potentially make them more desirable. Bacon should not be a large part of your weight loss diet, but including it in an occasional meal might be fine. The key to weight loss is taking in fewer calories than you burn, so the specific amount and types of food you eat while dieting depend on your activity level, height, weight and overall health. According to the Weight Control Information Network, a healthy weight loss plan is one focused on vegetables, fruits, whole grains and low-fat dairy. Protein choices should include mostly lean meats, fish, poultry, eggs, nuts and beans instead of fatty cuts of meat. Also try to limit saturated fat and trans fats, cholesterol, sugar and salt. Bacon is high in both calories and fat, so it should be eaten in moderation in any diet. One slice of bacon contains about 42 calories and more than 3 grams of fat. 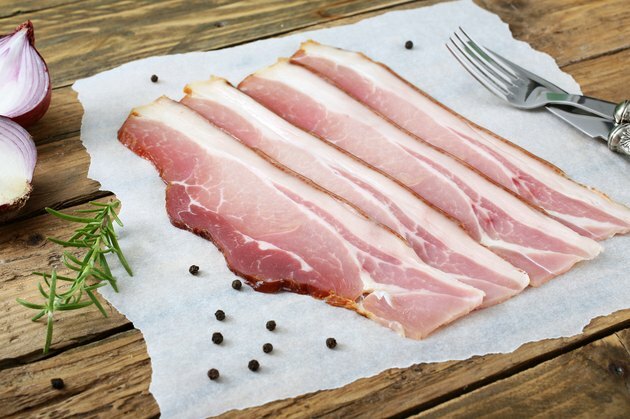 One gram of fat in a slice of bacon is the unhealthy saturated kind of fat, which can potentially contribute to heart disease, as well as hinder weight loss efforts. Another problem with bacon is its high salt content. Bacon has 192 mg of salt per slice, so it isn't healthy, even when you aren't trying to lose weight. Some low-carb diets might not limit fat or calories and don't differentiate between the types of fat. In these commercial diets, including bacon is neither prohibited or recommended, but including large amounts could come at a long-term cost to your overall health. In fact, most modern low-carb diet plans now recommend limiting meat that is high in saturated fat and choosing mainly from lean meats and foods high in monounsaturated or polyunsaturated fats. If you can't resist the taste of bacon, but are concerned about its effects on your weight loss, limit yourself to a single slice every once in a while. To make your small amount of bacon go further, crumble it and use it as a topping for a healthy salad or soup instead of just gobbling down a slice that could leave you craving more. You might also find that your bacon craving can be filled by a healthier alternative, such as lower-fat turkey bacon or lean sliced ham.